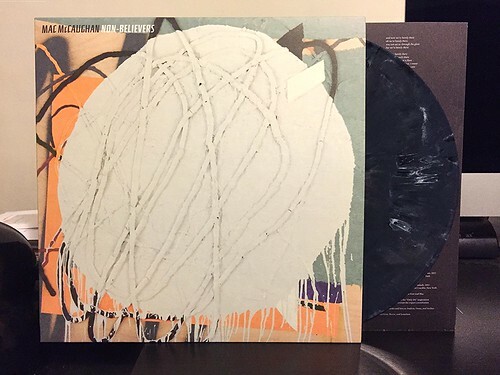 Non-Believers is the first solo album from Mac McCaughan of Superchunk fame. Typically when he's experimenting outside of Superchunk he uses the Portastatic moniker, but there was something about Non-Believers that made him want to attach his own name to it. Reading interviews and website descriptions it seems that Mac considers this a highly personal work and that warranted the change up. I'm not really concerned about what Mac decides to bill himself as on the record, my only concern is whether I like the record or not. Frankly, it's a mixed bag. On the handful of upbeat tracks with prominent guitars, I think it's pretty fun. Songs like "Our Way Free," "Box Batteries" and "Barely There" showcase why Mac is respected as such a great songwriter. They're not as loud or rambunctious as Superchunk, but they still retain the enthusiasm and melodies of his other outlet. When Mac strays from this formula is when I tend to lose interest. There's a good amount of synth and electronic drums and those songs just don't work for me. Once you start into the territory of the slow, plodding "Real Darkness," I've pretty much checked out. The other song that doesn't work for me is "Only Do." Musically it's pretty good, but lyrically it really suffers with it's Yoda-like chorus "There is no try/there is only do." As I said at the beginning, this is definitely a mixed bag of an album. The songs that are great are really great. On the opposite side of the spectrum, the bad songs are pretty bad. As a whole, it's probably worth picking up if you're a big Superchunk fan. You'll probably want to skip a few songs here and there though.